For your ease we provide you with links to each section separately; however, you are bound by terms stated in each section and all the sections collectively. The product and/or services including playing of free and Real Money Games is restricted to persons who are 18 years of age or older and are bona fide residents of India, except for the states of Assam, Kerala, Odisha and Telangana. We may limit access to our product and/or services at our discretion. By reading this document you confirm that you are not accessing our product and/or services from anywhere in the state of Assam, the state of Kerala, the state of Odisha, state of Telangana or outside India. You understand and are in agreement with the fact that we will deduct tax at source or TDS at the rate of 30% on winnings greater than INR 10,000 from your account. In such cases, we shall credit such winnings to your account after deducting TDS at the rate of 30%. At present, TDS is applicable at the rate of 30% on winning above INR 10,000 and this TDS rate as well as its applicability is subject to changes from time to time as required by law. Your winnings from a single Pool Rummy Game, a single Points Rummy Game, a single Deals Rummy Game or a single contest or tournament are credited into your wallet in the form of Passion Chips, which may be recontributed towards future games or tournaments, or cashed out (except in the case of bonuses, which cannot be cashed out). Winnings are computed on a net basis, exclusive of your contribution to the game / tournament. Should you choose to withdraw your winnings, the Passion Chips are converted into cash. There are no caps on the amounts you can withdraw from your wallet. Upon making a withdrawal request, the balance deposit is first returned to you, and any remaining withdrawal amount is deducted from your winnings. Assume a player wins INR 14,000 cash in a single game of Points Rummy. In this case TDS amount of INR 4,200 will be deducted from his win amount since his winning exceeds INR 10,000. The amount of credit he will receive in his account will be INR 14,000 – INR 4,200 = INR 9,800. Assume a player takes part in a game of Pool Rummy with INR 4,000 entry fee and his winning is INR 22,000 in that Pool Rummy game. The net winning in this case will be INR 22,000 – INR 4,000 = INR 18,000 and hence the TDS deducted will be INR 5400 i.e. 30% of INR 18,000. The amount of credit he will receive in his account will be INR 22,000 – INR 5,400 = INR 16,600. Assume a player takes part in a game of Deals Rummy with an entry fee of INR 10,000 and wins INR 20,000. The net winning for this player in this game will be INR 10,000 and hence the TDS deduction will be INR 3,000 i.e. 30% of INR 10,000. The amount of credit he will receive in his account will be INR 20,000 – INR 3,000 = INR 17,000. You will be permitted to withdraw your winnings only after you provide your correct PAN details and after the TDS has been deducted from the amounts withdrawn. We will verify your PAN details occasionally and have the right to forfeit any winnings in cash or kind if your PAN details are unverifiable, incorrect or are found to be inaccurate during our verification. TDS and / or any other taxes levied by the Government of India are subject to change and all applicable taxes will be deducted from your account. All rates mentioned herein are exclusive of surcharge and cess as may be applicable. RummyPassion.com will provide you a certificate of taxes deducted. RummyPassion.com is not a tax advisory body and is in no way responsible for your tax liability or filing. For real money games, contests, tournaments, marketing events and loyalty points program, Rummy Passion levies a service charge commonly known as ‘Rake’. The rake is a percentage levied for facilitation of game play. As of July 1, 2017 there is an 18% GST (Goods and Service Tax) levied on the rake and is applicable for deduction from Player Winnings. To complete the registration process on our website, you will have to choose a login name and a unique password. Besides these, you will be required to submit additional details which are compulsory. You will be asked to provide further details for us to verify you as a valid user. If you choose to play “Cash Games”, you will need to provide information including, but not limited to your legal name and residence, age, gender, email address, mobile number etc. You are responsible for providing us with correct and complete information and also for keeping this information updated. Also, you shall provide true and complete information as required of you on our website. Rummy Passion or Passion Gaming Private Limited or any of its partners or affiliates is not responsible for consequences that may arise as a result of you submitting untrue, incorrect or incomplete information. At any point, we may require documentation for verification of all or part of the information you provide or have provided in the past. Your failure to do so will result in the suspension or cessation of your registration with us. You hereby confirm the following. All personal details provided by you during the registration process or at anytime thereafter must be complete and truthful. You are responsible for notifying us on any changes that have taken place in your personal details from the time of your registration with us. You acknowledge that you undertake the responsibility of protection of all details you submit on the RummyPassion.com website. This includes but is not limited to your Username, Password, Email address, Postal Address Details and Mobile number. You should not purposefully or accidentally share your login ID or login password details with anyone. It is your responsibility to not allow anyone else to use your username and play from your account at anytime. You completely understand and are in agreement that RummyPassion.com or its partners or subsidiaries will not be liable for details that you or anyone else provides, or actions taken resulting in misuse by another person. RummyPassion.com is not liable under any circumstance if your user ID or password is revealed on its website or any other websites. For this we suggest that you log off your computer or mobile device completely once you have finished playing at the RummyPassion.com website. You understand and are in agreement with the fact that all deposits made to your user account which is held with RummyPassion.com is solely for playing cash games offered on its website. All deposits and withdrawals made into your account are specifically to be used by you and cannot in any circumstance be transferred to anyone else. You understand and agree that balance in your user account held at RummyPassion.com does not carry any interest or yield. You understand that you need skills and comprehension of all rules of the Games of Rummy to participate in cash games and that you are willing and physically and mentally capable of doing so. You are singularly responsible for all outcomes of you participating in the cash games, being associated obviously or tacitly with cash games. You clearly understand that RummyPassion.com is not liable or responsible for any financial or time loss that may be incurred by you because of your participation in cash games at RummyPassion.com. You must be 18 years of age or older to access and play cash games and transact with RummyPassion.com. You understand and agree that you are participating in cash games voluntarily. You understand completely that playing cash games can result in a money loss to you and that you undertake full responsibility of the consequences that are a result of participating in cash games, including financial risk. You consent to indemnify RummyPassion.com, its officers, employees, directors, partners and agents from liability of any claims or costs of your participation in cash games in case of your financial or time loss. Your participation in products or services does not qualify you to receive a prize or money from RummyPassion.com. Your skills, understanding and application of game rules and ability to play better compared to your opponents will decide the outcome of the cash games. You are individually and singularly accountable for all matter you post, share, upload, transmit, or make available through any other means on the RummyPassion.com website. All matter that you post should be free from plagiarism or it should be licensed to you or it must legally belong to you. By making any content public on the RummyPassion.com website, you grant us a fee-free, worldwide, non-absolute, perpetual and transferable right to use, copy, reproduce, update, change, publish, translate, create imitated works from, transmit, distribute, publicly display, and publicly perform your content and to use such content for marketing initiated and created by RummyPassion.com or our partners or affiliates. Such content may include, but not be limited to, your name, gender, photographs, quotes, username or location. You do not have any legal or rights, legal or otherwise, in any part or whole of your content. You give the right to RummyPassion.com or its partners, associates or affiliates to use all communication provided by you in any manner whatsoever. RummyPassion.com holds the right to record all user inputs and content, including email communication and chat messaging on the website or communication sent by users electronically or via post through built-in interactive features on its website. If for any reason whatsoever, you are unable to log on and operate your user account or are unable to play any game or participate in any contest, competition or tournament, you shall not hold RummyPassion.com responsible. Terms and conditions applicable to bonuses, promotions and other marketing activity are written under the Promotions Tab on the RummyPassion.com website. You agree to read, understand and accept all these terms and conditions before you claim bonuses, promotions and other marketing initiatives. To see the latest promotions, visit our Rummy Promotions page. RummyPaasion.com may seek to verify its players' user accounts via phone calls or emails. More than one attempt may be made to communicate with you. If you do not provide us with a correct phone number or email address, or, fail to update your personal information, we bear no responsibility for interruption of services due to us being unable to reach you. We may block your services if we are unable to reach you. You may not be able to log into RummyPassion.com, make a deposit, withdraw funds or play games if the validation is unsuccessful and till the time that we are able to satisfactorily validate your user account. We will ask you to submit a valid proof of identification and proof of address as we may require it from time to time. Once we receive valid documents from you, your user account will be reinstated. It may take a few working days to do so and may not happen immediately. If upon making several unsuccessful attempts at contacting you or in the event that you are unable to provide valid documentation as required by us, we hold the right to delete or suspend your user account and refund the funds in your user account after adjusting any processing fee, taxes, service charges, or any other transactional cost that is applicable. Refunds will be made in the form of a cheque which will be mailed to the address provided by you. If you provide an incorrect mailing address, RummyPassion.com will not make further attempts for delivery of the cheque. You accept that you yourself will play all games on our website and will not take external assistance of any kind to play. You agree not to use or create cheats, hacks, bots or automatic play, software, external or internal device or any other unauthorized component which is capable of blocking, modifying, manipulating, mining, intercepting, collecting or relaying information from or to the RummyPassion.com website. Use of external assistance of any kind is strictly prohibited while accessing RummyPassion.com website or playing games on it. Furthermore, Rummy Passion confirms that there are no use of bots or automatic play by the company. Fraudulent behaviour including chip dumping, forming teams and collusion between you and any others for participating in games or tournaments organized on the RummyPassion.com website or any other form of deception is banned. If any fraudulent behaviour by you is ascertained, the game or games in question will be rendered null and void and will initiate an action against offenders. Any winnings, rewards or deposits to such blocked accounts for fraudulent behaviour will be forfeited and will be confiscated. All bonuses, rewards, points, prizes and winnings are solely for a specific user. These cannot be transferred to another user account. If you attempt to transfer such winnings, rewards, points, prizes or bonuses to a user account which is not yours, such winnings and rewards will be forfeited. Sending unsolicited communication or SPAM emails in order to get registrations for RummyPassion.com or to benefit from its Refer a Friend program is strictly prohibited. Money Laundering including, but not limited to attempting cash withdrawal of unused funds added through credit cards or deliberately losing money to a specific player(s) is prohibited at RummyPassion.com. You can only register as a single user and hold a single user account on RummyPassion.com. You cannot create or use multiple user accounts using multiple email ID’s. Multiple user accounts even if linked to separate and unique email ID’s are considered invalid by RummyPassion.com. All activity from multiple user accounts of any one single individual will be rendered null and void. You are prohibited from creating a user account to upload or post, distribute, share, transmit or publish content on the RummyPassion.com website or on any of its social media assets that is obscene, abusive, criminal, illegal, malicious, threatening, menacing or invades privacy. Products and / or services of RummyPassion.com cannot be used for any commercial intention such as but not limited to use in a gaming club, cyber cafe, network play online or to connect to unauthorized servers that copy the gaming experience on the RummyPassion.com website. Any action by you to introduce and transmit such content that may contain computer viruses or computer contaminants as described in the Information Technology Act 2000 or other laws applicable in India which may sabotage and stop or limit the functionality of software, equipment or machinery owned or operated by RummyPassion.com or which is used for providing products and services by RummyPassion.com is strictly prohibited. Seeking another person’s user ID, password, account details or personal details or accessing the email database of users or gathering their personal details including recording their activity on the RummyPassion.com website is strictly prohibited. Any person or persons who are employees, directors, officers or agents of Rummy Passion or are related to such persons, are not allowed to play any Real Money Games on the rummy passion website, other than in the course of their employment with Rummypassion.com. Related persons in this case refers to any person or persons who are legally related to employees, directors, officers or agents of Rummy Passion and include spouse, financially dependent children and financially dependent parents. An Escalation at this stage will be resolved within 48 hrs by Customer Service Head. An Escalation at this stage should be resolved within 1 week by Operations Head. All Payment and Withdrawals transactions on the RummyPassion.com website shall be conducted in Indian Rupees. All deposits and withdrawals must be made through your user account at RummyPassion.com. You may participate in Cash Games and Rummy Tournaments only through your specific user account at RummyPassion.com. You will be able to make payments into your user account using accepted payment instruments which you are authorized to use. RummyPassion.com may restrict the amount of money you can add to your user account as management at RummyPassion.com wants you to play responsibly. Processing of payments made via credit card, debit card, e-wallets, prepaid cash cards and internet banking are processed through gateways owned and operated by third-party payment. As third parties who process such payments require authorization, RummyPassion.com is not responsible for disruptions, denials or delays caused at the payment processors end. Only when your transaction is authorized, the funds will be credited to your user account and will be available for you to participate in Cash Games. RummyPassion.com can cancel a transaction at any time based on its discretion. If before the transaction is cancelled, the payment is successful, the transaction will be reversed. The money in such case will be credited back to your payment instrument. In case of cancellation request or refund request initiated by the user, Rummy Passion will upon its discretion credit the user's account with the refund amount or cancellation amount in 3 to 5 business days. You may withdraw your winnings via an account or via an electronic bank transfer. You can send a withdrawal request to withdraw your winnings. Withdrawal limits and bonus or prize restrictions are applicable to all withdrawals. All bonuses including promotional winnings can be withdrawn when you have met the play through requirements specific to that bonus or prize and when you have made a minimum of one cash deposit and played at least one cash game at RummyPassion.com. You may make as many withdrawals as you like. All withdrawals may be subject to a processing charge depending on withdrawal made without game play and/or number of Instant Withdrawals made. In a rare situation if a cheque is issued, RummyPassion.com will assume all cheques that are not cashed within 30 days of dispatch to be lost and has the right to cancel that cheque. We hold the right to instruct to our bank to stop payment of that cheque. In such a case, the cheque may be dishonoured and RummyPassion.com will not be liable or responsible for that cheque amount to you. You may submit a request for reissuing of the cheque which RummyPassion.com will execute subject to deduction of applicable processing charges from the amount of the cheque. Our effort is to process your withdrawals within the stipulated time but there could be delays because of time needed to complete verification and completion of the withdrawal transaction. However, once your withdrawal is approved by us, you should receive it within 24 hours. In a situation, if you do not receive your withdrawal within 3 days, you can contact us through our redressal system. RummyPassion.com is not liable to pay you any compensation for delays in remitting payments to you due to wrong bank details provided by you or banking delays. You can only play and participate in games, contest, tournaments, competitions and other services, offered by RummyPassion.com if you are a legal resident of India and must be present in India while accessing the products and/ or services offered by this website. You must be a resident of India and be physically present to claim a winning also. If you face interruption of services due to any reason including slowness or disruption of Internet services or communication interferences or caused by the hardware or software you are using, RummyPassion.com is not responsible or liable for any losses caused to you. Permanently cancel your User Account and bar you from re registering on the RummyPassion.com website. Cancel any games and, or winnings from prior games. Forfeit the cash amount in your user account. In case we suspend your user account, you cannot question this decision and agree that this decision will be binding on you. Products and/or Services and content on the RummyPassion.com website and the content published are "as is" and we hold no liability for any inconsistency or imprecise information displayed on this site. We are responsible for any oversight or content related mistakes. Our effort is to provide the correct and current information at all times. We call upon you, our player to report any inconsistency or inaccuracy that you observe so we may correct it. 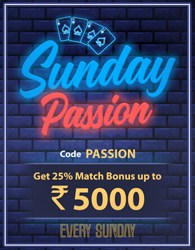 RummyPassion.com endeavours to provide each player with an amazing online and mobile Rummy experience, but issues related to the website, software and server such as but not limited to viruses, faults and downtime may take place and these occurrences are beyond our control. Marketing, branding and content on the Rummypassion.com website or communication sent by it are copyright protected. Use of such items without explicit permission of management at RummyPassion.com will be considered a violation of copyright and trademark laws and is punishable by law.